US-27 to High St. At stop sign, bear Right to remain on High St. 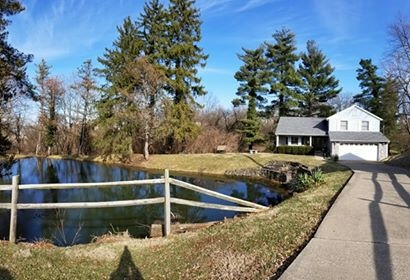 Yes, that is a pond in the front yard of this unique home & setting in the city feels like being in the country. Sitting on 1 acre of land w/lots of pine trees. The open concept of this home begins with the oversized entry foyer & dining room combined w/columns overlooking the living room. Eat-in kitchen overlooks the pond. Family room in Lower Level. Natural woodwork, cathedral ceiling in Master Bedroom. Large deck spans the back of the home is great for outdoor entertaining. Owner/Agent. NOTE: This property was sold on 4/4/2019 and is no longer available. The details listed below are believed accurate to the date of the sale and are subject to change.